In yo’ face Sande, get tae fook Walkmen, bye bye Bishi. Trapped Mice 'Winter Sun' fends off three in the Royal Rumble of 2012’s top 100 albums of the year courtesy of God Is In The TV Zine. Nicely Done. 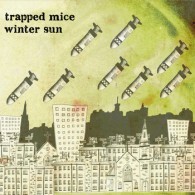 You can get 'Winter Sun' on CD/Download here.